Nobody wants to come home to a smelly house. If you’ve got tough household odors, but are not a fan of harsh synthetic chemicals, consider essential oils your new best friend. While unpleasant odors may be a fact of life, adding more synthetic chemical concoctions to your home doesn’t have to be. 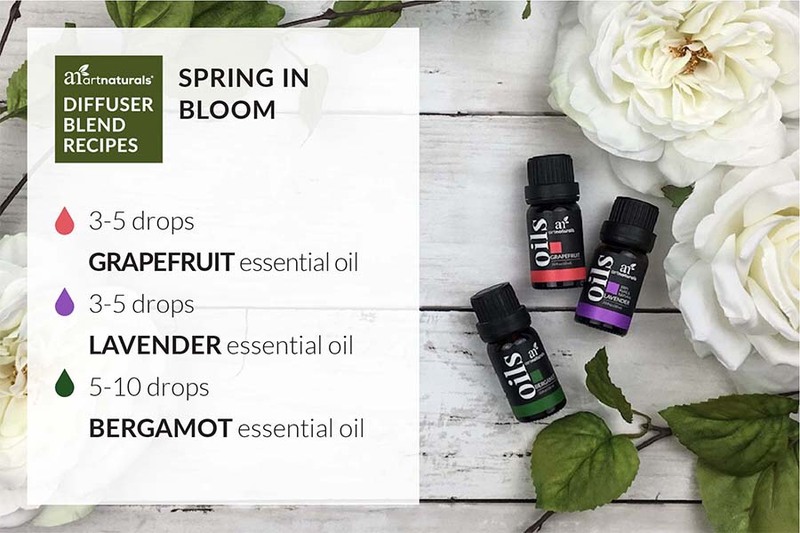 Natural essential oils can easily give your home those fresh spring cleaning vibes. All those air fresheners designed to mask bad smells might seem like the easy way out, but they can actually be dangerous for your health. Chock full of awful chemicals like formaldehyde, solvents, and benzenes, prolonged exposure to them can have serious repercussions. Why even take the chance when you can swap them out for fragrant, all natural essential oils? Essential oils are the safer, more eco-friendly option for keeping your home smelling fresh and inviting. If you’re serious about cutting down on potentially hazardous chemicals in your home, try these 5 super easy essential oil DIYs for cleaning and freshening. When it comes to household odors, trash cans are some of the worst offenders. Essential oils not only help cover up bad smells, but some also help cut down on the bacteria that causes stinky odors in the first place. The best Essential oils for fighting bacteria on various surfaces are ones that have shown high antimicrobial activity like tea tree, lavender, lemongrass, and eucalyptus. Lavender may also help keep away house flies. To fight off garbage odors, simply soak a cotton ball in essential oil and drop it in the can underneath the liner. You can use any essential oil you like for simple fragrance purposes, but we recommend sticking to the ones with the most antimicrobial activity. Our favorite blend of essential oils for this particular DIY takes into consideration the tough job of fending off stinky trash odors, and also smells fantastic! Add 5-10 drops each of lemongrass, lavender and eucalyptus essential oils to one cotton ball and replace every time you change the bag. If you’re a fan of all-natural cleaning, you probably already know about the amazing cleaning power of simple white vinegar. However, the smell of vinegar can be quite potent and is not for everyone. Luckily, essential oils are aromatically strong enough to stand up to vinegar and make your all-natural cleaning solution smell better. Of course, knowing that certain essential oils also fight off surface bacteria, adding them to your cleaning routine is a no-brainer! Try this essential oil solution for wiping down kitchen and bathroom surfaces for regular cleaning, or add 1 cup baking soda for heavy-duty cleaning. Pro tip: Keep this essential oil mix handy in a spray bottle for wiping down doorknobs and common areas during cold and flu season. 1. All water and vinegar to bowl, then essential oils. 2. Mix together thoroughly then use to wipe down surfaces. Essential oils can work their magic on laundry in a couple of ways. Firstly, if you have sensitive skin or prefer all-natural laundry soap, then you’re probably already avoiding synthetic fragrances like the plague. Adding 5-10 drops of any essential oils to any bottle of unscented laundry detergent is an all-natural way to make your laundry smell awesome! Adding essential oils with bacteria fighting properties can also help boost the cleaning power of your detergent so odor-causing bacteria doesn’t stand a chance. Note: When mixing your own essential oil laundry soap it’s important to consider the color of all your ingredients. Eucalyptus and lavender essential oils are completely clear and lemongrass is a barely noticeable shade of pale yellow. As long as the essential oils are properly diluted there should be no issue with discoloration, but it’s always a good idea to spot test any new DIY recipe on an inconspicuous area. Add the essential oils below to a 16 ounce bottle of unscented laundry soap or detergent and mix well. Dryer sheets are notorious for being full of synthetic chemicals and fragrances. Natural wool dryer balls are just as effective at eliminating static cling, if not more so. If the switch to wool dryer balls has you missing fresh-from-the-dryer warm, scented laundry, essential oils are the answer. All you have to do is add 1-2 drops of any essential oil you prefer to each dryer ball and dry as usual. Shoe odor! It’s such a struggle, especially if you have a large household. Whether it's your partner’s sweaty gym shoes, loafers you always wear without socks, or your kids’ sports cleats, things can get funky pretty fast. Again, essential oils come to the rescue by not only masking shoe odor, but also helping reduce the bacteria and fungus that contribute to the smell. Tea tree essential oil, in particular is often used in foot care aimed at discouraging foot fungus. Basically, tea tree oil and toenail fungus are not friends because it helps reduce fungus and bacteria on the surface of your shoes and feet. For smelly shoes, stinky feet and general foot care we give this recipe two toes up. 1. Add dry ingredients to bowl and stir until mixed. 2. Add essential oils to mason jar and swirl until mixed. To use on shoes: Sprinkle 1-2 tablespoons of your essential oil powder mix inside shoes, shaking shoe to evenly disperse. Let sit overnight (or longer) and shake out before wearing. To use on feet: Pat dry sweaty or freshly cleansed feet. Sprinkle essential oil powder all over your feet, paying special attention to between your toes. Put on your shoes and/or socks as usual. Linen sprays are incredibly handy for refreshing blankets and linens that have been sitting in a closet or stale-smelling soft furnishings like couches, curtains, and throw pillows. Making your own with essential oils means you’re not adding extra chemicals just to make your house smell nice. Of course, the added bonus of using essential oils to refresh soft furnishings is that you can also cut down on any lingering bacteria hanging around. This essential oil spray is particularly useful for items that can’t be thrown in the washing machine. 1. Add essential oils to your spray bottle, using a funnel if necessary. 2. Fill the rest of the way with witch hazel. 3. Cap tightly, shake to mix. Spray on linens and soft furnishings as needed. 4. After storing your essential oil spray, shake before using again. Of course we can’t talk about how to use essential oils to freshen your home with talking about diffusing! Diffusing essential oils is the best all-natural alternative to air freshener wall units and sprays. Obviously, diffusing essential oils makes your home smell pretty wonderful, but did you know there are benefits to simply inhaling the aromas? Essential oils can help elevate your mood and allow you to control the feel of your space. Some bacteria-fighting essential oils like lavender and eucalyptus have even shown some promise for fighting airborne fungi too. Diffusing essential oils delivers a triple whammy of delightful fragrance, inviting atmosphere and helping clear the air. How Do You Use Essential Oils Around the House? These recipes use some of our favorite artnaturals essential oils for freshening house and home. Share your favorite essential oil cleaning recipes in the comments below!